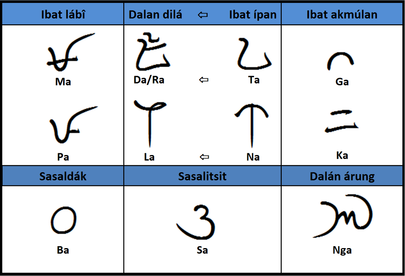 Súlat Kapampángan, also known as Culit, Kulitan and Pamagkulit is an indigenous writing system of the Kapampangan people, Sulat Kapampangan is an abugida or alphasyllabary, where the consonantal characters possess a inherent vowel sound that can be change with use of diacritical marks, Sulat Kapampangan can be written left to right and below to down note that Sulat Kapampangan has rules on each direction, above image is a chart for vertical writing. The first line of the song Atin Ku Pûng Singsing written vertically. The first line of the Kapampangan song Atin Ku Pûng Singsing written horizontally, left to right. ( ´ ) above the vowel when in medial position, indicating a lengthened vowel sound. GARLIT ‘dot’ or ‘stroke’ above it. For example, Sa becomes Si by placing a stroke above it. GARLIT ‘dot’ or ‘stroke’ below it. For example, Sa becomes Su by placing a stroke below it. Since the Kapampangan sound ‘E’ was created from the monophthongisation of the diphthong ‘AI’, simply place the vowel character I right next to it, to change the default ‘A’ sound of any of the consonantal characters to ‘E’. Since the Kapampangan sound ‘O’ was created from the monophthongisation of the diphthong ‘AU’, simply place the vowel character U right next to it, to change the default ‘A’ sound of any of the consonantal characters to ‘O’. For example, Sa becomes So by placing the vowel character U right after it. Simply add the vowel character 'A' right after it. For example, Sa becomes medial SÁ or final SÂ by placing the vowel character 'A' right after it. Simply place the vowel character 'I' to a consonantal character whose default sound has already been altered to ‘I’. For example, to make SI into SÍ or final SÎ simply add the vowel U right after it. Simply place the vowel character U to a consonantal character whose default sound has already been altered to ‘U’. For example, to make SU into SÚ or final SÛ, simply add the vowel character U right after it. left side of the character. right side of the character. Since the Kapampangan sound ‘E’ was created from the monophthongisation of the diphthong ‘AI’, simply place the vowel character 'I' below it, to change the default ‘A’ sound of any of the consonantal characters to ‘E’. Since the Kapampangan sound ‘E’ was created from the monophthongisation of the diphthong ‘AU’, simply place the vowel character 'I' below it, to change the default ‘A’ sound of any of the consonantal characters to ‘O’. Simply add the vowel character 'A' below it. For example, to make SI into SÍ or final SÎ simply add the vowel U below it. For example, to make SU into SÚ or final SÛ, simply add the vowel character U below it. 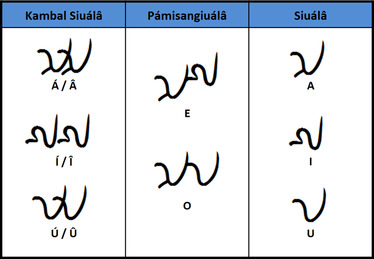 When writing SÚLAT KAPAMPÁNGAN horizontal, simply place the intended consonantal character below to the preceding character. This will terminate its inherent vowel sound.